Creating a compelling universe in under ten thousand words—the task of the short story writer—is one of literature’s most demanding challenges. Creating ten entirely distinct universes that successfully capture and distill the underlying ethos of the author’s own era is a literary event that occurs only a few times in each generation. 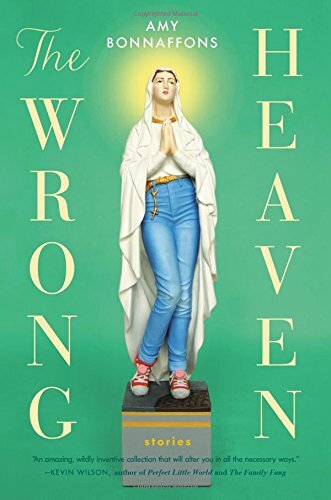 The publication of Amy Bonnaffons’s debut short fiction collection, The Wrong Heaven, reveals itself to be one of those elusive and enthralling occasions. The author strikes like an earthquake in a land that hardly recalls mild tremors, evoking quivers of awe at both the power of the written word and the scope of human imagination. And if that is not enough for audiences, there is also a copyeditor who turns into a horse. What is remarkable about The Wrong Heaven is that it is not only a brilliant story collection, but also a manifesto-in-action announcing what the contemporary short story should be. Novelist John Gardner (1933–82) popularized the notion—in a quotation that has been falsely attributed to both Tolstoy and Dostoyevsky—that “there are only two plots: a stranger rides into town, and a man goes on a journey.” This dichotomy may have aptly described the colorless, hidebound world of John Cheever and Alice Adams, but the rise of magical realism requires a new framework. Bonnaffons provides this scaffold explicitly in the collection’s title story, an unsettling tale in which a second-grade teacher purchases lawn ornaments of Jesus and Mary that spring to life when plugged in. The protagonist explains, in embracing this improbability, “I believe the world is malleable, that our understanding of it is provisional, improvised, subject to a change of rules at any time; that sometimes the magician pulls out the tablecloth and the dishes all stay in place, and sometimes the magician pulls out the tablecloth and everything is gone, including the table.” In Bonnaffons’s micro-universes, the rules change suddenly, often inexplicably—and the test is how the characters accept or reject those surprises. Bonnaffons is certainly not the only contemporary writer who brings this dynamic to short fiction. Her approach echoes that of Karen Russell, Kevin Brockmeier and Robert Olen Butler—to name a few of our most gift magical rule-shifters—but the striking and unflappable facility with which her characters address their new realities is something novel and breathtaking. Carl and Irene are well-matched as a couple, able to welcome the unforeseen and mysterious. Bonnaffons, for a brief interlude, persuades readers to believe in these possibilities as well. Any reader who cannot appreciate the compact virtuosity of these moments probably should not be allowed near a book without a tutorial on humor and a sound horsewhipping. In this regard, Bonnaffons is demonstrably wrong in one regard. The Wrong Heaven never disappoints. Bonnaffons is a authoritatively knowledgeable writer, dappling her stories with epigraphs from Rilke and Aristotle, and references to transcendental empiricist philosopher Gilles Deleuze and the 1960s sitcom I Dream of Jeannie. She is also an intensely wise writer who has a keen sense for the pulse of this complex moment in history—who has written stories in which facts, if not truth, are always negotiable. These stories are indeed strange, but no stranger than the political and moral universe we now inhabit, although infinitely more pleasurable and enticing. Jacob M. Appel's most recent book is The Amazing Mr. Morality: Stories. His debut novel, The Man Who Wouldn't Stand Up, won the 2012 Dundee International Book Award. His short fiction collection, Scouting for the Reaper, won the 2012 Hudson Prize. Other works of fiction are recipients of multiple awards. His stories have been published in more than 200 literary journals.